Missing Maryland Man With Dementia May Have Been Dropped Off in Anne Arundel Co. 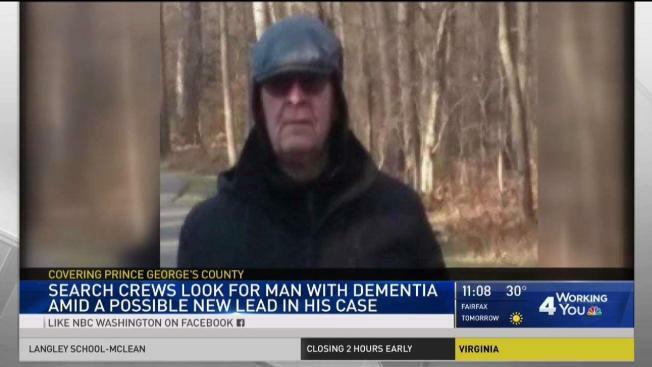 Missing Man May Have Been Dropped Off in Anne Arundel Co.
A Prince George's County, Maryland, man with dementia who has been missing from the Beltsville area for nearly a week amid freezing weather may have been picked up on Route 1 and dropped off in a town in Anne Arundel County, police say. 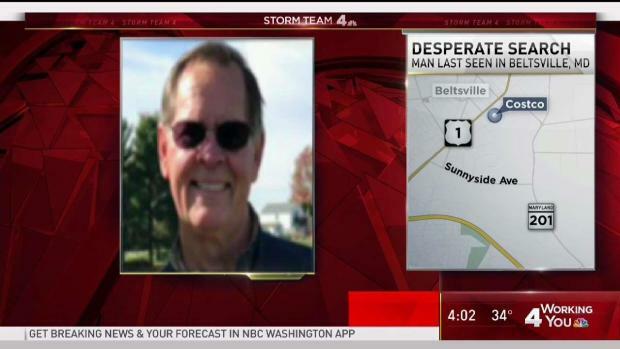 Daniel DeHaven -- a 65-year-old man who is nonverbal -- was last seen at 11:30 a.m. Tuesday at a Costco store on the 10900 block of Baltimore Avenue in Beltsville. Prince George's County police said on Sunday that a driver may have picked up DeHaven while he was walking on Route 1 and dropped him off in the 800 block of Annapolis Road in Gambrills. Police are telling people to lookout for DeHaven in that area. A group of 200 volunteers who organized online searched neighborhoods in the area on Saturday and headed back out on Sunday. They asked anyone with outdoor surveillance cameras to check the footage to see if anyone with DeHaven's description appears. The son of Daniel DeHaven spoke with News4's Tracee Wilkins about the desperate search for his father. "We're not going to stop because he wouldn't stop. If it were any of us, he wouldn't stop," he said. To get involved in the search, visit the Help Us Find Danny Francis DeHaven Facebook page or email finddannyfrancisdehaven@gmail.com. DeHaven's family hopes he found someplace warm to rest and has been there. "We're just trying to stay focused on keeping hope going, and focusing on the search," DeHaven's son, Kevin, said. "We're not going to stop, because he wouldn't stop," Kevin DeHaven said. "If it were any of us, he wouldn't stop." Police and volunteers have been searching for Daniel DeHaven around the clock despite blustery temperatures. "The snow that's coming and the dipping temperatures are not on our side," Prince George's County Police Department spokeswoman Jennifer Donelan said Wednesday. Daniel DeHaven. His clothing at the right is what he was wearing when he was last seen. Police in Greenbelt, Laurel and Montgomery County, as well as federal officials, are helping search for Daniel DeHaven. Daniel DeHaven, who goes by Danny, did not have identification with him when he disappeared. "He's a kind man. He's approachable. If you see him, he's not able to communicate, necessarily, but if you call out 'Danny,' he'll know his name and most likely, you'll be greeted by a smile," his son said. Police received a tip that a man meeting Daniel DeHaven's description was seen in downtown Silver Spring, but they were unable to find him. Daniel DeHaven is 5 feet 9 inches tall and weighs 175 pounds. He has brown eyes and partially gray hair, police said. He was last seen wearing a gray hat, black coat and blue jeans. 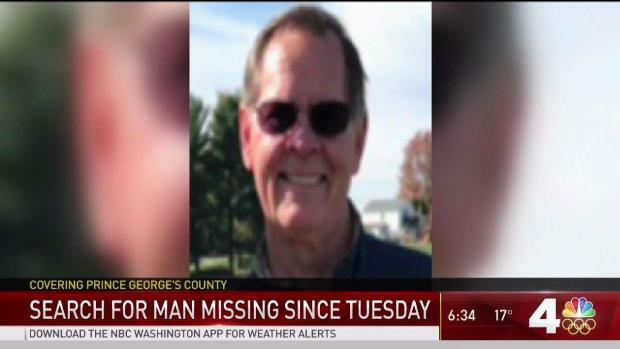 A man with dementia has been missing more than 24 hours as snow approaches Maryland. News4's Tracee Wilkins reports on the urgent search. Anyone with information on Daniel DeHaven's whereabouts is asked to call police immediately at 301-699-2601.